Storytelling wizard J.K. Rowling mines the times and transforms the series with The Crimes of Grindelwald. It’s a dark time for the wizards. Yes. It’s one of those sequels. While the human element remains the top draw, there are improvements over the first Fantastic Beasts. The visual effects are more striking and better crafted. The beasts are indeed more fantastic. And the story is darker. Much darker. That’s not to say the first episode was a light-hearted romp of rainbows and unicorns. And that’s not to say “dark” is a bad thing, either. Following in the footsteps of classics like The Empire Strikes Back, the heavy darkness gives this story an unexpected level of sophistication. It very well might put off Potter purists, but it’s nonetheless an admirable storytelling venture. While some of the whimsy and charm of the first movie have gone missing, overshadowed by the grim tale of Gellert Grindelwald (Johnny Depp, The Pirates of the Caribbean), there’s something about this somber fantasy that is unusually compelling. There’s a fascination here that borders the fantastic. And there are parallels to today’s highly-charged and uber-sensitive climate in politics and society as a whole. Setting this tale in the late 1920s, with the wounds of World War I still healing and fresh scars on the horizon, allows for an even more ominous backdrop as the characters globetrot from the U.S. to the U.K. and over to France. The sprawling, intricately detailed urban landscapes of London and Paris offer all sorts of opportunities for a visual flourish and director David Yates, now a long-time collaborator with this wizarding world’s matriarch, J.K. Rowling, takes full advantage of it. The imprisonment of the evil Grindelwald is short-lived and he’s quickly back out in the world, seeking to fulfill his dream of ruling both the magic and non-magic realms. Grindelwald’s got a velvet tongue, seemingly saying all the right things — and quickly drawing an audience of eager supporters. He’s a persuasive one, that Mr. Grindelwald. But listen closely. He’s not so nice. Sure, everybody has their place in the world. And it’s certainly not that muggles are a lesser being. They just... um... serve a different purpose. Getting into the vibe, there’s quite a bit to relish here. And there’s more. While Newt contends with his own personal heartbreak, there’s also the ongoing story of Credence (Ezra Miller, Justice League) as he continues to search for his own identity. As with Star Wars: Episode V, there’s a juicy twist here. But is it real? Or is it a ploy by Grindelwald to seduce Credence, just as Darth Vader tried to seduce Luke Skywalker over to the Dark Side? 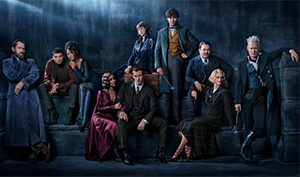 Well, if Rowling and Yates have their way (the odds are in their favor), there are still three more episodes to spin in this Fantastic Beasts series. Stay tuned, true believers. Repeatedly drawing parallels to the Star Wars universe is a bit unfair, but extremely convenient. After all, both series dip into the same pool of storytelling archetypes that have existed for just about the same amount of time as humanity and civilization. It’s good versus evil. Light versus dark. And the seemingly out of place character, whether it’s Luke Skywalker or Newt Scamander, is the one that rises to the top. Eddie Redmayne finds just the right tics and insecurities, the perfectly awkward mannerisms to flesh out the character of Newt Scamander. And he’s joined by two A-listers, Johnny Depp and Jude Law (Sherlock Holmes: A Game of Shadows) as a young Albus Dumbledore, in giving this magical series gravitas and credibility. Plus, the growing supporting cast offer their own pleasures in defining quirky muggles, witches, aurors, obscurials, and legilimenses. This isn’t a standard leave-your-brain-at-the-door fantasy. This is a complex, multi-layered universe of ideas that represents a high-water mark in creativity. While the Star Wars prequels (Episodes I-III) are widely regarded as the weakest entries in that canon, the Fantastic Beasts series is shaping up as an intriguing, grown-up back story to the wildly popular children’s books starring Harry Potter.